ETHNN is looking for a few good men and women! ETHNN is conducting a Comprehensive Community Needs Assessment and we need volunteers. The purpose of this assessment is to discover the unique needs of our community as they relate to education, employment, health care, housing, child care, transportation, and legal matters.Understanding the nature and extent of poverty in our area is extremely important to the well being of our community today and in the future. 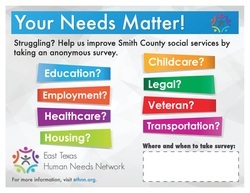 Volunteers will interview low-income and vulnerable individuals and families throughout Smith County social services agencies. You will be trained and then assigned to an agency based on your availability. You can give as much or as little time as you have to share. If you have already participated in training, please click below to schedule your volunteer hours. If you want to participate, please complete the Volunteer Inquiry form and we will contact you soon. Questions before you make this decision?